Take an ordinary deck of cards. Pull out the two of diamonds and put it aside. Shuffle the rest of the deck, then divide it into three (approximately) equal piles of cards. Now, this is the point where I confess that -- no matter what whimsical wonders I accomplish with my card-cajoling chicanery -- they pale in comparison to the mental majesty that awaits in GURPS Dungeon Fantasy 14: Psi. This synapse-sizzling supplement greatly expands all things psionic in a Dungeon Fantasy campaign. It includes two dozen Psionics abilities (Madness! Mind Blast! Psychokinetic Lash! ), the mentalist profession (with power-ups and side-profession options), and psi-related gear. It also tells you how to incorporate psi into a campaign -- including how to introduce it to an existing world -- plus an extensive table of psionic threats and nine nasty monsters to inflict on over-thinking adventurers. This tantalizing tome was scribed by Dungeon Fantasy's awe-inspiring architect, Sean Punch, so you know it's chock full of brain-bending possibilities. 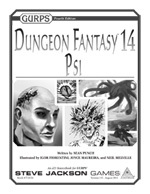 If you want to unleash the full power of the mind in your Dungeon Fantasy campaign, GURPS Dungeon Fantasy 14: Psi is the only supplement you need. Oh, that card you picked out earlier? If I'm not mistaken, it was . . . the . . . two of diamonds. BELIEVE!